Painting of the house is to be done every 5-10 years. It depends on the last paint you used and the way the task was carried out that how long will the paint last. Now when we know it is inevitable it is better to start looking for a personnel to help you carry out the operation. To get the best output with the least payment to pay we recommend you read this article very carefully. The first question you should be asking yourself is whether you need a pro or you can manage it yourself. If you are one of the people who have learn the things from Google at the spot then it is better you let a professional company take over. Doing the work yourself will help you save your money but it will require a lot of effort and consume too much of your time. The quality of their work will definitely be a lot better than your own. 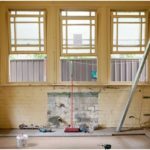 And most importantly the rate at which a professional can complete a work along with his crew is no match but if you have a tight budget DIY is probably the only choice here. For every task it is important that you work out the preliminaries. For getting your house painted you need to work before letting the contractor take control. You must be able to clean the walls yourself before the paint starts. This lets the paint stay on longer. You will have to move the furniture of your house to avoid it from getting ruined by the paint. Power outlets and sockets should be dealt with as required. You must allocate an area for the staging area and where the mixing and everything in between will be done. After this comes the real hunt of finding a good contractor. The best way is to listen to word of mouth. The reviews on the website can be trusted only when the website is purely review written by a selective jury or a guide. The search result through Google can give a pretty good idea. All in all have someone to vouch for the contractor before you sign the contract. The house painting company you select must be real professional in its dealing. They must promise you timely work and give you an entire chart of how they will carry on the work. They must give you estimates and provide wall cleaning service. The package should include touch-ups when necessary. The types of companies in the market are different. There are companies which are very good at their work but are small scale and take more time. There are every type of painting company present. All you need to do is look at all the pros and cons from whichever company in the pool and select the one where the pros outweigh the con with the biggest margin. House painting companies are always there to get started with the house but looking at all the parameters you must take a good decision on what to do since both time and money will be used. Painting of the house is to be done every 5-10 years. It depends on the last paint you used and the way the task was carried out that how long will the paint last. This entry was posted in Home Improvement and tagged exterior painting, House Painting, interior painting, Paint, painters, Painting, painting company, painting contractors. Bookmark the permalink.